What order do i run the quest? Aww no Basement O Rats with the bundle. I was looking forward to that one to get my kids' feet wet. Looks like they will have to face werewolves instead. Basement o Rats is included in the downloads for the core rules. Let me know if you can't locate it. please could you send me an invoice for order number 15890049. Many thanks. Hi Julie, you should have gotten an email confirmation of the order? Can you check your account. Any deadline/time limit on those 50% off coupons on print version? Nope, they last forever. Use them as many times as you like. Stumbled across this game today and bought the whole bundle. Can't wait to play it! My son will love it. Hopefully my wife will play with us. How young does this play well with? My son is pretty young. He's young enough that he would probably not enjoy losing a battle very often at all. Hi Charles, Hero Kids plays best from 5 to around 8 or 9. And, if you're concerned about him losing battles, try giving him a pet to adventure with. I'd like to second the previous statement - ready to purchase as well but couldn't find the print option.. The Hero Kids print options are available on the three print books (Core rules, Adventure Compendium, and Monster Compendium). The discount vouchers for these books are in the confirmation email for the Hero Kids Complete Fantasy PDF bundle. Awwww, the Print option seems to have disappeared, and I was ready to re-purchase this (there are items herein that I don't yet have.) to grab those nifty coupons for print copies. Superamalgamated bummer! I want to purchase this bundle to have all the stuff to play with my nefew but I don't really understand what do we have in this bundle. Do we have ALL the pdf published so far or do we have only what we can read on the description? So with that bundle do I have to buy the core set anyway? Well, I went ahead and bought the bundle. Ideally, I'll be able to get to the the library (my printer is broken) and print this stuff out and we can try to run a game with our daughter. It seems like a lot of fun, so I hope she enjoys it. We've been wanting to try a role-playing game with her for a while now. Also, I did not get a pdf version of the Fantasy Adventure Compendium. Is that not a thing? I searched through the files and I didn't see it there, but it seems like it should be part of the bundle. The Fantasy Adventure Compendium is simply a compilation of the adventures already published & included here as PDFs. To my knowledge you aren't missing anything of the official Hero Kids stuff by picking up this bundle. I'm considering this for my six year old and her ten year old friend. Are the scenarios playable with only two characters or is a bigger group needed? Hi Klaire, all of the adventures are playable with 1-4 players (and a GM). I purchased this bundle and 3 things. 1. I never received an email for 50% off code for the physical copies. I have checked all my folders. 2. Is there any way to get all the monster cutouts for tokens other than buying the PDF+physical copy? "As a valued customer, you are entitled to a 50% discount on the softcover print version of the Hero Kids core rules, the Hero Kids - Fantasy Monster Compendium, and the Hero Kids - Fantasy Adventure Compendium. Use these links to purchase the discounted version." Is this also available in German or Danish? If not, how feasible is it to translate it myself? The core 10 Hero Cards are available for free in German, and I'll have a Danish version out soon. Hello Justin! This is great news! Can you give me a guesstimate when the Danish will be ready? Need any help on that? I don't know if you've gotten your answer elsewhere already, but the character cards themselves have been translated into Spanish, and many other languages, presumably by fans fluent in those languages. Getting translation work done on more extensive products would be really expensive though, unless/until a fan would offer to do so for free or cheap. I suspect there hasn't been much demand for it yet. Not seeing the coupon for the softcover copy. Hi Kennan, it will have been included in the DriveThruRPG order confirmation email. You might have to scroll down a few pages to find the blue link. I found it, many thanks! I didn't seem to get my coupon for the print copy? Not sure what's going on but I purchased this and there's no download option for the main rpg pdf...help? 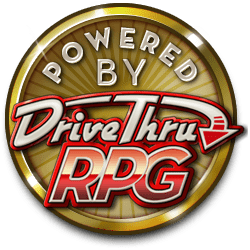 DriveThruRPG went down last night when I was updating the core rules files. I've just added the files now, so you should shortly receive a notification email. I got it and it's working. Thank you so much!! !